Last week the Full Time MBA Scholarships Ceremony took place at ESADE, where the Alfa Consulting MBA Scholarship was awarded. 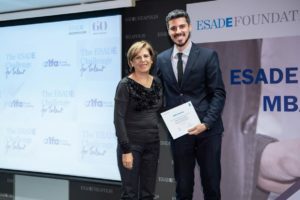 ESADE Business School offers and awards a considerable number of scholarships to outstanding Full-Time MBA candidates during their admissions process. The aim of this is to recognize and encourage talented candidates applying. Among these, Alfa Consulting is one of the International Institutions that supports the talent at ESADE Business School. We offer up to three Scholarships to selected candidates with an excellent academic record and clear potential to influence the future of business. Last week we attended the ceremony where the Alfa Consulting MBA Scholarship was awarded to two students: Jonathan Peralta Santos and Humberto Ataide. The Scholarship Ceremony was a remarkable moment both for us and the students. We are proud to be able to support future leaders.